No, it's not the last straw, but it's really close to the last damned straw. 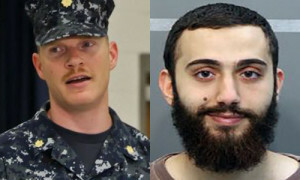 When Abdulazeez attacked the US Military recruiting station in Tennessee, a US Marine (deceased) and a US Naval Officer (still alive) returned fire. The Obamanation wants to see that officer cashiered. (Allen West) As reported ten days ago by Western Journalism, “A Navy officer and Marine reportedly returned fire at the shooter who killed five service members in Chattanooga, Tenn., even though current policy does not permit military members to carry firearms on facilities such as those where the attack occurred. "The cold-blooded assault killed four Marines and one active-duty Navy reservist. The center’s commanding officer, Lt. Cmdr. Timothy White, used his personal firearm to engage the shooter during the attack, according to sources quoted in the Navy Times. A report from The Washington Post said that one of the Marines killed in the shooting might have been carrying a 9 mm Glock and possibly returned fire on the shooter. "At the time, Western Journalism wrote, Lt. Cmdr. White could face disciplinary action for violating policy about possessing a weapon on the facility that was supposedly a gun-free zone." We are going to end his career and court-martial a man who drew his sidearm to protect his command, and the assigned Sailors and Marines. The Navy should give him the Bronze Star with a V device...and would in another, saner world. I can only hope that LCDR White used JiHAWG ammunition when he shot the terrorist, but I digress. Please allow me to frame this in an even more disturbing way. The big effort within the Navy now is to work to lift the ban on transgender sailors serving on active duty. There is big preoccupation with that at the moment in the Pentagon with pressure from the White House to make it happen. Thus the Obamanation is laid bare and thus the matter is made complete. Truth: LCDR Timothy White is better off out of the Navy. It's no place for warriors, though the transgendered and homosexual crowd can find a comfortable home there. There's a lot of outrageous conduct from Washington DC. 50 million babies dead, body parts for sale to the highest bidder, and a complicit government. Military officer cashiered for killing a terrorist who wiped out his command. Green light to Iran to push toward nuclear weapons, igniting a nuclear weapons race in the Middle East, etc. You wonder if there's a limit. Every single time I think that we have reached the limit, there is more. “Fontaine with an e. Fontaine Mitchell.” I flashed back to the young man who Warren Barshall called, ‘Fontleroy’. He did look more like a Fontleroy. Spoiled face, fleshy lips with a slight overbite, hair too fashionable, manners too pristine. The sweat rings under his arms as he was on his way to see Barshall were too profound. He looked to me as if he’d lost his dog, his best friend and wrecked his car all on the same day. I think it had more to do with a fear that Warren would discover his homosexuality and out him to the world, and to his mother, who hoped in vain for a grandchild. “It’s like a father’s authority. A father’s burden. It’s too much for some people. I want to see a certain toughness in people, but the kind that doesn’t veer toward callous. Because that’s a dangerous road. Aggression is necessary. Don’t look at me like that, it is and so is compassion and a sense of fairness. “I look for men who are thorough, who have good eyes and steady habits. They ask the right questions. A smart, steady man is very hard to find. Someone who knows how to talk to people. Somebody knows when to shut up and listen. God doesn’t make very many men like that, does he?” Warren scrutinized me from under his bushy eyebrows. The bartender brought more drinks and both Warren and I pounded them and motioned for another round. Warren looked around at the smoky, cramped bar. Most of the men were hard-worn, watching basketball on the television, scraps of neon, tinsel, Razorbacks football posters. If they recognized him as their governor, they didn't acknowledge it. 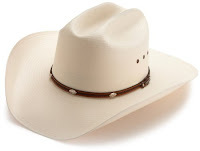 I grabbed my hat, perched it on my head and stood, turning to walk outside. He followed my lead, dropping cash onto the table. We emerged into a warm, humid summer night. I looked back at the bar. It had been constructed a century before out of old bricks and limestone cube. The neighborhood around it bore the tatters of an abandoned commercial neighborhood. Small strip stores with broken windows and cardboard patches, kudzu and ivy growing wildly all over everything, high grass breaking through cracks in the sidewalk. In this story, there are people who are identified and unidentified. Warren Barshall is the Governor of Texas, though the state is not mentioned. There is a bit of Texas in the story just because. The person reporting to him is his favorite Texas Ranger (law enforcement, not the baseball team) and that person is never mentioned by name because it's written in the first person. I wrote it as a study in contrasts last week. You can file it under matchmaking, Texas style.